Packed full of powerful, easy to use features, Sanitaire's commercial upright, model SC899, reduces cleaning time and is UL listed. This Sanitaire has a 16-inch cleaning width that allows the user to clean more in one pass than other commercial uprights. The exclusive Vibra Groomer I brushroll loosens dirt that is embedded into carpets. The removable Quick Kleen transparent fan chamber makes cleaning or changing the fan fast and easy. With a chrome steel hood, 50-foot power cord, 6 carpet level positions and a brilliant headlight, large rooms will be cleaner in less time. The Sanitaire wide area commercial upright, model SC899, is packed with high-quality, easy to use features that reduce cleaning time. This Sanitaire has a 16-inch cleaning width that cleans more in one pass than other commercial uprights. Loosening dirt that is embedded in carpets is effortless with the exclusive Vibra Groomer I® brush roll. After deep cleaning, the micron filtration captures and contains dust and allergens, improving air quality and reducing the dust levels and the cleaning work. Large rooms will be cleaner in less time with a 50-foot power cord that cleans a larger area without the need to change outlets. The six carpet level positions adjust to all carpet heights for maximum cleaning and a brilliant headlight spots dirt in hard to see places so rooms will be cleaner, faster. Cleaning and changing the vacuum fan is fast and simple with the removable Quick Kleen® transparent fan chamber. The Sanitaire chrome hood covering helps extend the life of the machine. The Sanitaire wide area upright, model SC899, has a suggested retail value of $424 but you get to pay way less. 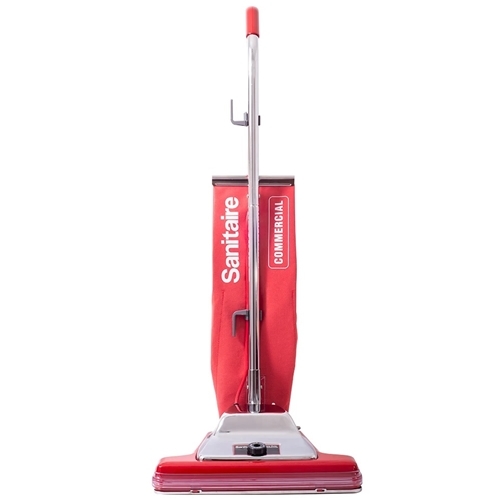 For a heavy-duty and dependable commercial vacuum that cuts cleaning time and cost, consider the UL listed Sanitaire upright, model SC899.